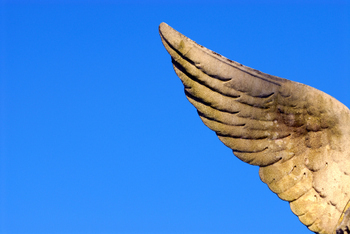 Where does the concept of angel wings come from? In the Bible, angels are not described as having wings. In fact, you will find many instances in the Bible where these heavenly beings are described as having a very human countenance. So, there is little information about wings of angels in this Holy Book. You will find, however, many depictions of angels with wings. 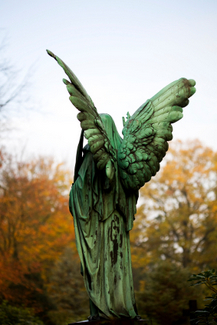 Indeed, angels with wings are featured in paintings, engravings and statues. It seems like artists gave angels wings to emphasize the divinity of such beings. After all, wings are airy, light and almost magical. Ahura Mazda – A winged deity in Zoroastrianism. Cupid – The Roman god of love (Eros in Greek mythology). Hermes – the Greek messenger god (known as Mercury in the Roman pantheon). Isis – an Egyptian goddess often depicted with wings. Mors (also known as Thanatos in Greek mythology) – the Roman god of death. Nike – the Greek goddess of victory. Wings are most often associated with good. However, there are a few villains and demons who also sport wings. Archangel, Birdman, Hawkgirl, and Zauriel (the angel from the Justice League) are some of the heroes who have wings. Now, here’s small collection of angel wings. You may use them as inspiration to draw your own angelic wings. Below you will find the lovely wings of an angel, seen from behind. 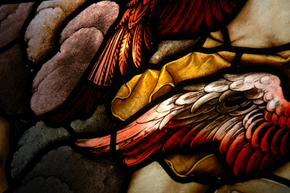 This is a detail of a larger work depicting an angel's wing. 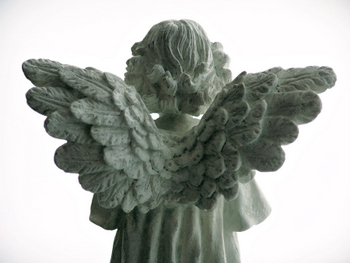 These are the wings of a stone angel. This is an isolated angel wing sculpted in stone. Drawings of Angelic Wings - If you love drawing celestial beings, you will find inspiration here. More Angels Wings - Find here additional depictions of angelic wings. Wings of Guardian Angels - A page dedicated to pictures of guardian-angel wings.